Among the NJIT researchers at the forefront of studying the star closest to Earth is Andrey Stejko, a Ph.D. candidate in physics. 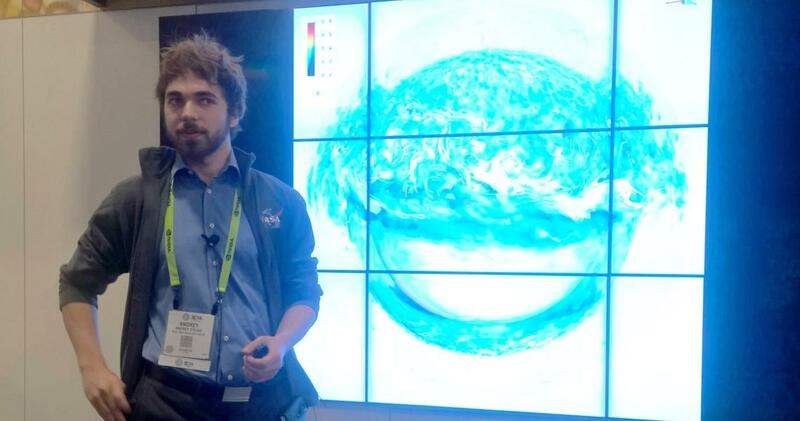 His research, supported by NASA, is focused on using a combination of high-resolution 3D models, scientific visualization, and supercomputers to gain a deeper understanding of the Sun’s magnetic field and the effects of space weather on our home planet. The significance of Stejko’s research was recently underscored by being featured as part of NASA’s participation at SC16, an international conference on high-performance computing, networking, storage and analysis held in mid-November in Salt Lake City, Utah. Stejko is pursuing this investigation with the guidance of Professor of Physics Alexander Kosovichev and in affiliation with NJIT’s Center for Computational Heliophysics (CCH). The primary goal of the CCH is to develop innovative data-analysis and modeling tools for heliophysics through the combined expertise of the Department of Computer Science and the Departments of Physics and Mathematical Sciences in partnership with NASA’s Advanced Supercomputing Division based at the NASA Ames Research Center.